화엄사 대웅전에 모셔진 삼존불은 화엄사상의 삼신불인 비로자나, 노사나, 석가불을 표현한 것인데, 도상면에서 법신, 보신, 화신(응신)을 나타내는 매우 귀중한 예이다. 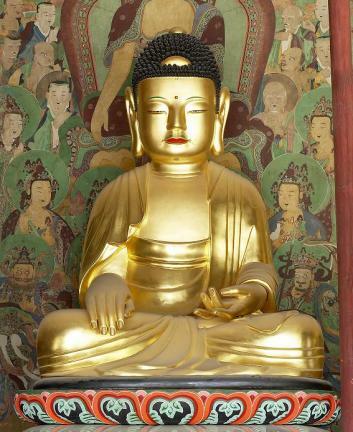 이러한 삼신불은 불화에서는 많이 보이지만 조각으로는 드문 편이다. 특히 보관을 쓴 노사나불이 조각으로 남아 있는 이른 예는 별로 알려져 있지 않다. 이 삼신불상은 크기가 거대하고 단순하고 깊이의 강약이 느껴지는 굵직한 옷주름의 표현은 한층 상의 중후함을 더해 주고 있다. 특히 『화엄사사적기』(1697년 간행)에 의하면 1636년 조각승 청헌, 영이, 인균, 응원 등 전라도와 경상도 지역에서 활약했던 17세기의 대표적인 승려장인들이 공동으로 제작한 상임을 알 수 있다. 따라서 이 화엄사 대웅전은 삼신불상은 조성연대를 짐작할 수 있고, 도상이나 양식면에서 17세기의 기준이 되는 불상으로 높은 의의가 있는 상으로 평가된다. 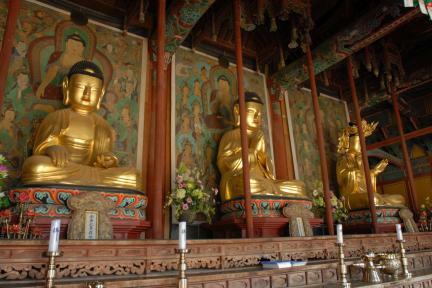 These Buddhas of Three Bodies – Vairocana, Rocana and Sakyamuni – representing the threefold body or nature of the Buddha worshiped in Avatamsaka (Hwaeom) School are enshrined at Daeungjeon Hhall of Hwaeomsa Temple. 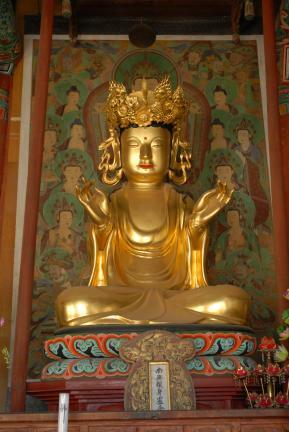 They stand for the dharma body, the bliss body and the transformation body, respectively. 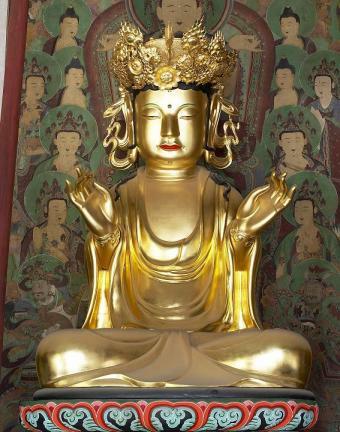 This is a rare case where sculpted images of all these three Buddhas remain, especially the Rocana wearing a crown, while they often appear together in paintings. 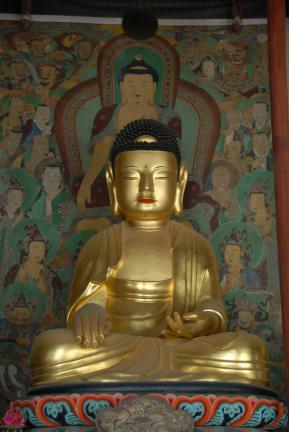 These images are large and majestic, with the simple but thick folds in the robes adding to their solemn impressions. 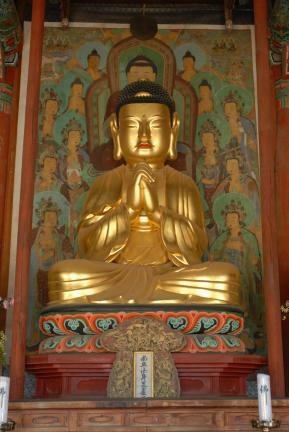 According to a record of Hwaeomsa Temple history, compiled in 1697, the images were jointly carved in 1636 by several famous sculptor monks, including Cheongheon, Yeongi, Ingyun and Eungwon, who were active around the Jeolla-do and Gyeongsang-do Region in the 17th century. 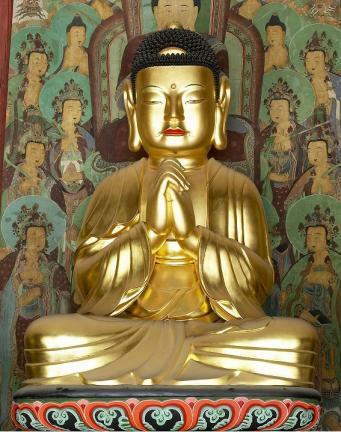 Clearly dated, the images are highly evaluated as important references for the study of 17th century Buddhist sculpture as well as iconographic research.